»Do You Know About This Hidden Hill Fort In Uttar Pradesh? Do You Know About This Hidden Hill Fort In Uttar Pradesh? Uttar Pradesh is one of those few states in India where one can learn in detail about the bygone era of the country. It is here where you are taught about the Vedic Period, the Medieval Period and the Modern Era. Therefore, it is a prominent tourist spot for travellers. From the great Taj Mahal to the ancient Varanasi, there are thousands of places that can interest you to the core. But how about keeping these popular places aside this weekend and exploring something new and untouched? If you are willing to do so, then plan a trip to the ruined yet marvellous Vijaygarh Fort. It is a hill fort in the close proximity of Varanasi. Keep in mind that it is not easy to find hill forts in Uttar Pradesh. Well, let's move ahead and learn more about the fort. The region in and around Vijaygarh Fort experiences hot summers, and hence avoid visiting the region during the summer season. If you are looking forward to savouring the best of natural surroundings and exploring the history of the fort comfortably, then the best time to visit it is from October until the end of February. Vijaygarh Fort is located in the Sonbhadra district and is said to be one of the oldest forts in the state. As per records, it has a history of thousands of years. The fort was built in the early Medieval Period of India. However, later on, it was reconstructed and renovated in the year 1040 by Maharaja Vijay Pal, a Rajput king. 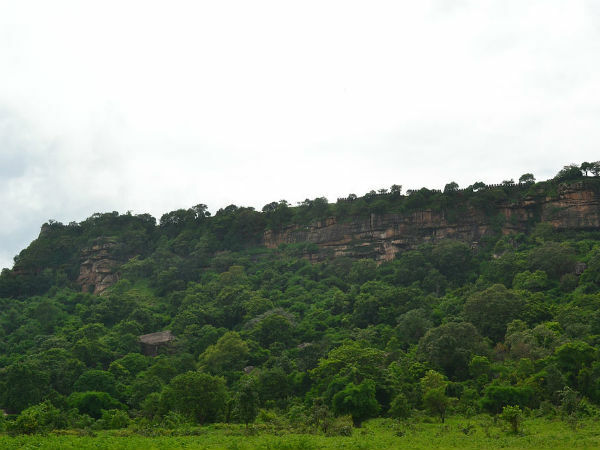 Today, the fort is lying in ruins and is surrounded by lush green vegetation. The ancient tanks named Mira Sagar and Ram Sagar, ruined temples and the tomb of Hazrat Meeran Shah Baba can still be found within the fort complex. Vijaygarh Fort is a destination for those who always look forward to witnessing new places in Uttar Pradesh. As it is one of the few hill forts in Uttar Pradesh, it becomes a must-visit destination for every traveller and tourist. Here, you can learn about the past of the Benaras Kingdom and savour the best of natural beauties. So, don't you think a visit to Vijaygarh Fort would make for a wonderful getaway? If you are bored of visiting the same old monuments again and again, then you shouldn't miss out on this ancient marvel. After all, it is one of the hidden places in Uttar Pradesh and is easily accessible. By Air: The nearest airport to the fort is located in Varanasi at a distance of about 125 km. Once you have reached Varanasi, you can either hire a direct cab to the fort or catch public transport to reach Robertsganj and then from there, an auto rickshaw or a cab to the fort. By Rail: The nearest major railhead to the fort is located in Robertsganj at a distance of about 22 km. From Robertsganj, you can use any public transport to reach the fort. By Road: Being a hill fort, one needs to trek to reach the fort. However, the base of the fort is easily is accessible by road.